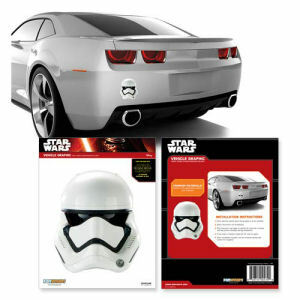 We have Just Sold out of Star Wars Episode VII - The Force Awakens First Order Stormtrooper Helmet Car Decal. This Item is unavailable at present. From the Star Wars collection by Fanwraps. Star Wars Episode VII - The Force Awakens First Order Stormtrooper Helmet Car Decal. The decal measures approximately 6.5 inches tall by 575 inches wide. After installation the decals can be easily removed but not reapplied. Safe on all automotive paints and finishes.